Q: What is The Ultimate Dining Card Gift Card? A: The Ultimate Dining Card is a multi-brand gift card redeemable at all 9 of Cara’s restaurants. It is a convenient Gift Card that is easy to purchase, redeem and reload. Q: Where can I use The Ultimate Dining Card? 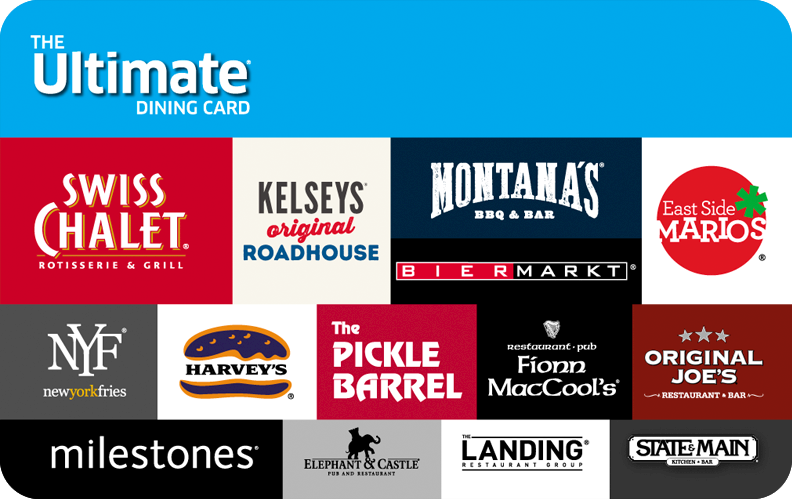 A: The Ultimate Dining Cards can be used at any Montana’s Cookhouse & Bar TM, Swiss Chalet Rotisserie & Grill®, Harvey’s®, Kelsey’s®, Milestones Grill + Bar®, Bier Markt®, East Side Mario’s®, Fionn MacCool’s®, Darcy McGee’s®, Tir nan Og®, Paddy Flaherty’s® and Casey’s Grill Bar® restaurants in Canada.